A space telescope designed to look into the furthest-most reaches of space at some of the most energetic phenomena in the known universe has, once again, been turned to face our nearest star, producing a rare and beautiful insight to our X-ray sun. Usually, NASA’s Nuclear Spectroscopic Telescope Array, or NuSTAR, would be looking at relativistic jets of material blasting from black hole behemoths millions to billions the mass of the sun, or the superheated hearts of supernovae, but in a follow-up to arguably one of the most beautiful space images ever created, astrophysicists have created a full-disk portrait of the high-energy X-ray-generating processes in the sun’s corona. In this stunning image, NuSTAR X-ray observations (in blue) have been superimposed over ultraviolet observations made by NASA’s Solar Dynamics Observatory (SDO) and lower-energy X-rays imaged by the Japanese Hinode observatory to produce a wonderfully psychedelic solar view. The solar corona — the sun’s multi-million degree “atmosphere” — is a hothouse of magnetically-dominated processes and the focus of one of the most enduring mysteries in stellar science. Put simply, the corona is too hot; the tenuous plasma that extends from the sun’s photosphere (colloquially known as the sun’s “surface”) can be millions of degrees Kelvin (Celsius) hotter than the sun’s uppermost layers. Classical thermodynamics shouldn’t allow this to happen — it doesn’t, for example, get hotter the further you move your hand away from an open flame. 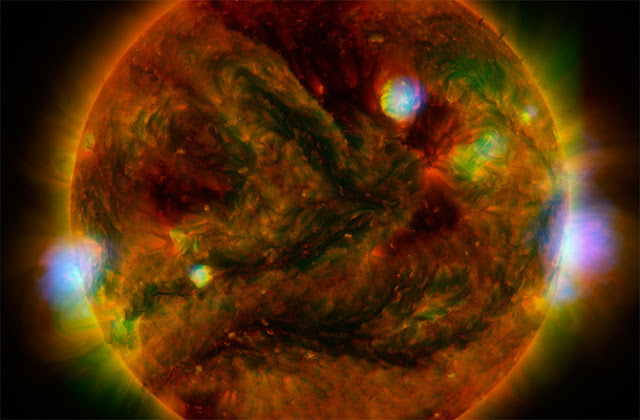 But solar scientists are hot on the trail of finding out what mysterious coronal processes must be going on and these unique observations by NuSTAR may be able to help out. One coronal heating mechanism focuses on small-scale flaring events called nanoflares. These flares may be small on solar scales, but they are thought to dump huge quantities of energy into the corona, heating it. Current observatories cannot see individual nanoflares as they are too small to be resolved, but they do generate X-ray emissions right in the observing threshold for NuSTAR, so the mission should be able to spot their high-energy X-rays. As the sun is still fairly active in its 11-year solar cycle after reaching solar maximum in 2013, the mission has picked out some regions in the sun’s atmosphere rumbling with X-ray activity, with “hotspots” over active regions bustling with microflares and, possibly, nanoflares. Hannah presented this observation on Wednesday at the National Astronomy Meeting in Llandudno, Wales. To measure a definitive nanoflare signal, however, the sun needs to calm down to a more quiescent state, a phase that solar astronomers are anticipating over the next few years as it approaches solar minimum. A slowdown in magnetic activity will reduce the number of active regions and quench powerful flaring activity. In this quiescent state, the high-energy X-ray nanoflare emissions could be detected from the noise. “We still need the sun to quieten down more over the next few years to have the ability to detect these events,” said Hannah.